ARP Head Stud & Intake - Exhaust Manifold Gasket Set -18mm Head Gasket Ford 6.0L. ARP - Head Stud Kit. MAHLE -Engine Intake Manifold Set. MAHLE - Exhaust Manifold Gasket Set. MAHLE - 18mm Engine Cylinder Head Gasket x 2. 18 mm Alignment Dowels - Manufactured 2003 - Jan 11, 2006. This kit is not compatible with 20mm dowels. These extra heavy duty studs are rated at 220,000 psi tensile strength and provide the clamping force required to keep your 6.0L Powerstrokes cylinder heads from lifting due to higher combustion pressures. Manufactured in ARPs Santa Paula, CA plant from proprietary ARP 2000 material, with threads rolled after heat-treating to provide optimum fatigue strength. They are centerless ground to assure perfect concentricity. Also included in each kit are heat-treated, chrome-moly steel 12-point nuts and parallel-ground washers, with a black oxide finish for extra durability. ARP also offers the Inner Row Head Bolts as an add-on to compliment this head stud kit. Molded Rubber, Master Set - Contains Intake Manifold Gaskets Plus All Miscellaneous Gaskets and Seals Needed for Intake Installation. The success story begins in 1920 when pistons made of heavy gray cast iron were being used in internal combustion engines for automobiles. The Mahle brothers countered this trend by producing light-alloy pistons at their small, newly established companybut the technology is still finicky and problems come up frequently. To keep dirt and dust out of the engine, they eventually developed air and oil filters as well. Their perseverance paid off: the light-alloy pistons began to take over the market. Nowadays, half of all automobiles produced worldwide contain MAHLE components. MAHLE has developed from a small test workshop to a technologically leading, globally active Group. 4- Part Number: MAHLE - 54450A. 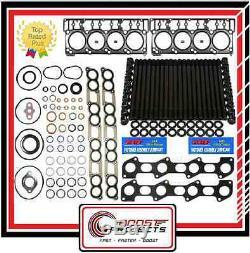 Supersedes: 54450; 1 Per Package, Includes Cylinder Head Dowels, Multi-Layered Steel, 18mm Black Diamond Coated Head Gasket. Constructed of (5) five stainless steel layers. Utilizing patented integrated push rod locators. Coated with a Victor Reinz proprietary fluoroelastomer (rubber) coating. The coating seals and impregnates into the mating component surface where it decreases friction forces and allows controlled sliding of the mating components relative to the gasket without fretting or damage to aluminum engine components. The Black Diamond coating is soft enough for cold sealing and features maximum adhesion, increased durability and temperature resistance and is also resistant to engine fluids including gas, oil and coolant. CP Cometic ACL Ferrea and ARP Kits. Local pickups are welcome for this item. Your address must be confirmed. Buyers who pay with unconfirmed addresses will not be accepted. We always look to satisfy our customers in whatever needs they may have. The item "ARP Head Stud & Intake Exhaust Manifold Gasket Set&18mm Head Gaskets Ford 6.0L" is in sale since Friday, September 16, 2016. This item is in the category "eBay Motors\Parts & Accessories\Car & Truck Parts\Gaskets\Full Set Gaskets". The seller is "boostprojects" and is located in San Diego, California. This item can be shipped to United States, Canada, United Kingdom, Denmark, Romania, Slovakia, Bulgaria, Czech republic, Finland, Hungary, Latvia, Lithuania, Malta, Estonia, Australia, Greece, Portugal, Cyprus, Slovenia, Japan, China, Sweden, South Korea, Indonesia, Taiwan, South africa, Thailand, Belgium, France, Hong Kong, Ireland, Netherlands, Poland, Spain, Italy, Germany, Austria, Israel, Mexico, New Zealand, Singapore, Switzerland, Norway, Saudi arabia, Ukraine, United arab emirates, Qatar, Kuwait, Bahrain, Croatia, Malaysia, Brazil, Chile, Colombia, Costa rica, Panama, Trinidad and tobago, Guatemala, Honduras, Jamaica, Bahamas, Viet nam.